During the climb out we get a good aerial view of the St Louis Lambert Airport and end the trip with a cockpit view of our landing at Iowa City Airport. In the descent, it’s a little bumpy due to summer thermals and as we turn into the sun for our landing on runway 25 the haze seems to reduce the visibility by half. 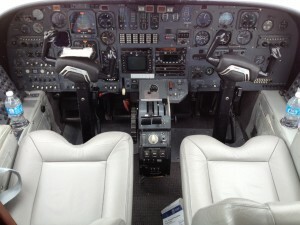 This trip was flown in a 1974 Citation 500 that had much of the original avionics in the panel. The 500 was the original light business jet and this one was still running on steam gauges. It had no thrust reversers or anti-skid and was equipped with an emergency drag chute. This aircraft was definitely old school, but sometimes that’s what it takes to get the job done. The Drag chute release was on the floor between the pilots. When the pilot pulled it up to arm the chute for landing it looked like he was applying a large automotive hand brake. In the possible event off brake failure, the pilot could deploy the drag chute and bring the aircraft to a stop. the drag chute eventually disappeared from later citations. 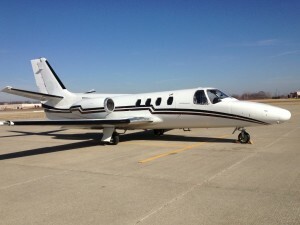 The Citation 500 was the first of the straight wing Citations built by the Cessna aircraft corporation. It was designed to compete not against the faster Lear jets but in the rapidly expanding business turboprop market. 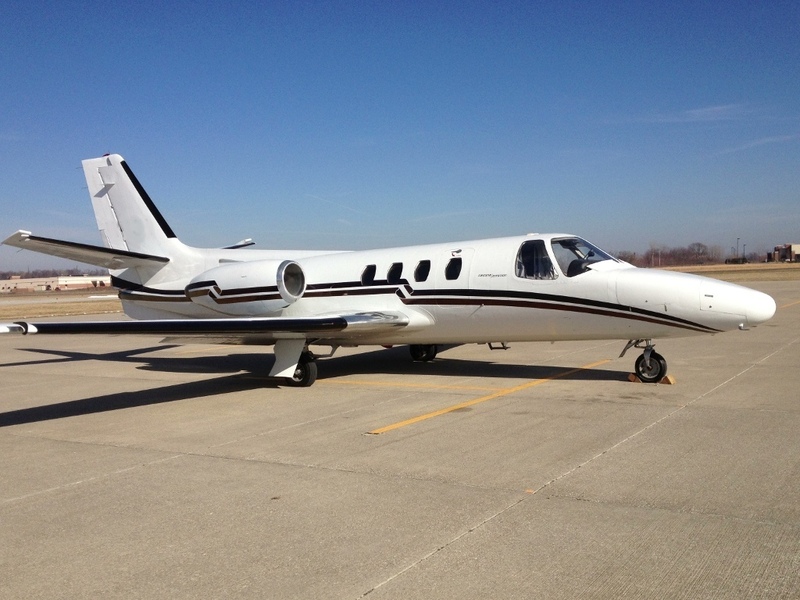 With a maximum takeoff weight of 11,500 lbs., a straight wing and turbo fan engines it could operate out of smaller airports and was much more fuel efficient than other corporate jets. The down side was that it lived up to its nickname of the “slowtation”. With a cruise speed of 345 knots, It was over 100 kts slower than the Leer Jet. The 500 is powered by two Pratt & Whitney JT15D-1 turbofan engines that produce 2,200 lbs. of thrust each. It has a range of 1,250 nm and a maximum altitude of 35,000 ft. The 500 was only in production for five years then Cessna added thrust reversers, lengthened the wings and renamed it the Citation I. This entry was posted in Cessna Citation and tagged airplane, ce500, cessna 500, cessna aircraft, cessna citation 500 cockpit, cessna citation landing, citation 500, cockpit view, iowa city airport, jet, specs on September 9, 2013 by James Sorsby.